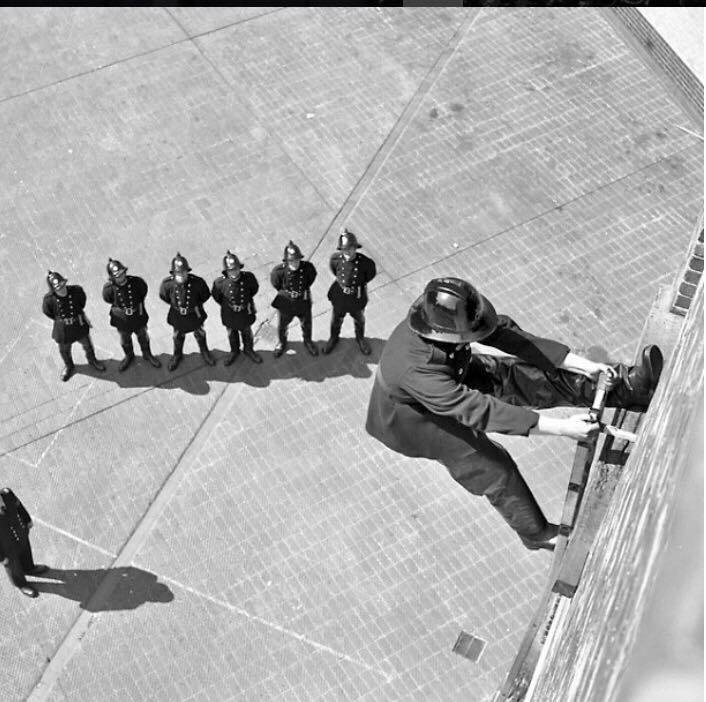 All firefighters when they first join are a long way from being let loose on the public. One thing they have to do is undergo an intensive training course which currently lasts about four months long. The training includes a lot of practicable work handling equipment, breathing apparatus as well as a lot of theory on the science of how things work. When I first joined West Ham Fire Brigade in 1964, as the brigade was too small to run its own training centre, I went to the renowned London Fire Brigade training centre at Southwark. As West Ham was to become incorporated into the Greater London Fire Brigade under the GLC in 1965, the training centre at Southwark became a place I was to visit often as I did more specialised courses in my career. Although they are no longer in use, something all firefighters including myself were trained to use is what is known as a Hook Ladder. This ladder had the reputation of sorting the men out from the boys and some trainees are known to have left just at the sight of them. As you will see from the photographs below, there was no safety equipment used with them and one quickly learned not to make mistakes. . The ladder was lightweight and used to flex by bowing inwards. It had a large metal hook at the top with jagged teeth on the underside. The idea was the ladder could be pitched from the floor below either by a firefighter hooked to the top of a similar ladder or sitting astride a window cill and leaning out with just one leg locking him in position. When the ladder reach the height of the window above it could be twisted sharply inwards smashing through the window and then hooking across the window cill. 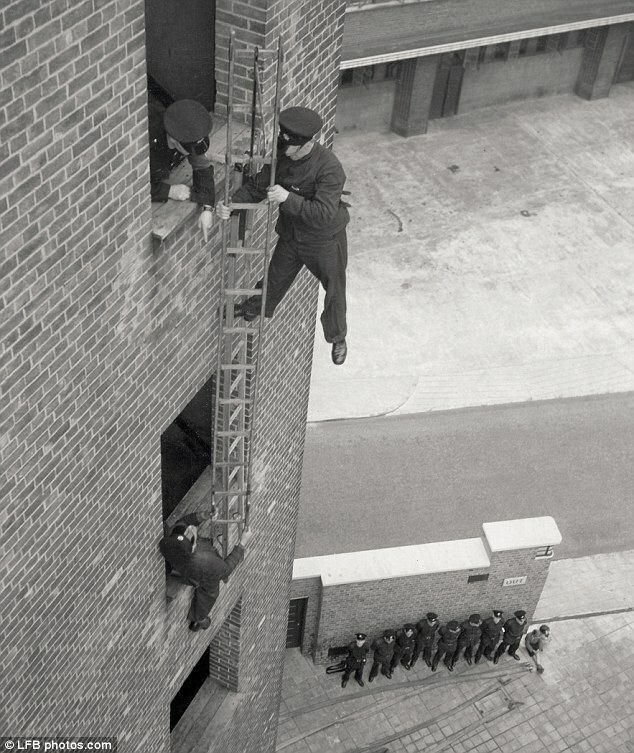 By then climbing the ladder and hooking onto the top, the same process could be repeated ad-infinitum with another hook ladder until the top of a building is reached. Needless to say a head for heights is a most desirable thing. Each fire station has a training tower and practicing using this ladder would be done at least once a week. Now looking at the pictures I sometimes wonder how I ever did it. I remember the tower in the prince regents lane fire station well. it was behind the fire station to the right .& was made of brick I used to watch the firemen practicing for ages ,from what we called the salt mine ,,which was adjacent to the fire station on the right of it. .the council kept the road salt in the big tin sheds their. Was the sand pit still behind the firestation when you were their ..they used to fill the sandbags their during the war. Yes the council depot was still there in my time, probably up until the time they built the school. At the back of the fire station yard was an old air raid shelter that went under the wall to an underground chamber which had another exit where grass by the school car park is now. As far as I am aware it was never filled in. The was also a gate in the back wall of the fire station that led to a large stretch of open ground that went all the way to Boundary Lane before the hospital and school were built. One piece of equipment we carried was a Schermuly Rocket pistol which fired a rocket with a grass line attached. It was a way of getting a line from the shore to either the fireboat or a ship. Because of space limitations we were never able to try it out but we did test it once on that waste ground. The rocket went streaking way into the distance with the line trailing behind it before finally coming down into a bush. Unfortunately it turned out the was a courting couple also in the bush who obviously though they had found a very private spot. I have never seen a couple run so fast. The chamber was originally an air raid shelter which was later converted to a breathing apparatus chamber that could be filled with smoke. It was also used for training merchant seamen from ships in the docks in ship firefighting. It was closed down in the late 1960's as it did not meet safety requirements. A new chamber was eventually built, a two storey building. That had a rat run built into it. A rat run is a maze with obstacles including sewer pipes and cages. The route through the maze which was on multiple levels, could be endlessly changed so the route could never be learned. It all sounds easy but when the drill is carried out in pitch darkness in 100% smoke and also with heat and humidity injected. That and wearing a compressed air set with a large cylinder on ones back made the whole thing very difficult. There was a control room in the building which could detect where anyone was through sensors. The whole place was wired for sound and if anyone got into real difficulties, emergency extractor fans could pull all smoke out the chamber in seconds. The whole building was a work of art but unfortunately was demolished when the station was recently rebuilt. You probably have already seen the video on YouTube of the Open Day 2012 at East Ham Fire Station. I couldn't get the link to work but you can find it by googling East Ham Fire Station. Many thanks for the link which I have added below. I had not seen this video before but it did bring back a lot of memories of East Ham Fire Station. I have worked there too as well as many other stations when filling in temporary staff shortages. The one thing I did find surprising was the speed at which the rescue exercise was carried out. To me it seemed as if the whole thing was done in slow motion. That may have been for the benefit of the crowd watching as normally it would have been done in a fraction of the time it actually took. Thank you for sorting out the link Mick and I was pleased that the video brought back memories for you. In 1967 I started work in the Welfare Department (later Social Services) and our offices were in the old East Ham Fire Station on the corner of Nelson Street and High St South. We used to joke that if the builders had left the firemans pole in place we could have got down the stairs much more quickly. Found the photo below of the old Fire Station/Welfare Department. Looks like it isn't being used any more. Sorry Linda - Not connected to your original post - but as a child I always loved visiting the Town Hall to pay the rates with my parents, going to the Library and seeing the Fire Engines in the old Fire Station. It always made me feel important, Really not sure what those buildings are used for today but let's hope Newham Council find use and retain them. Actually Doug you have reminded me of visits to the Cashiers Department in the Town Hall. Also the Children's Library which was next to the Swimming Baths. (We had a thread about it several years ago). Then as we got older we were able to use the Main Library. I can't recall seeing the Fire Engines in the Old Fire Station but I would have passed the building on the way to the Library and the Swimming Baths.